Hi loves! Since I'm on vacation right now (okay I'm back already but it's so nice to have all these amazing guestposts ^^), I asked some of my favorite bloggers if they wanted to do a guest post while I'm gone. One of the talented ladies that said yes is Paulina from Paulina's Passions. She is SO skilled in her nail art looks! 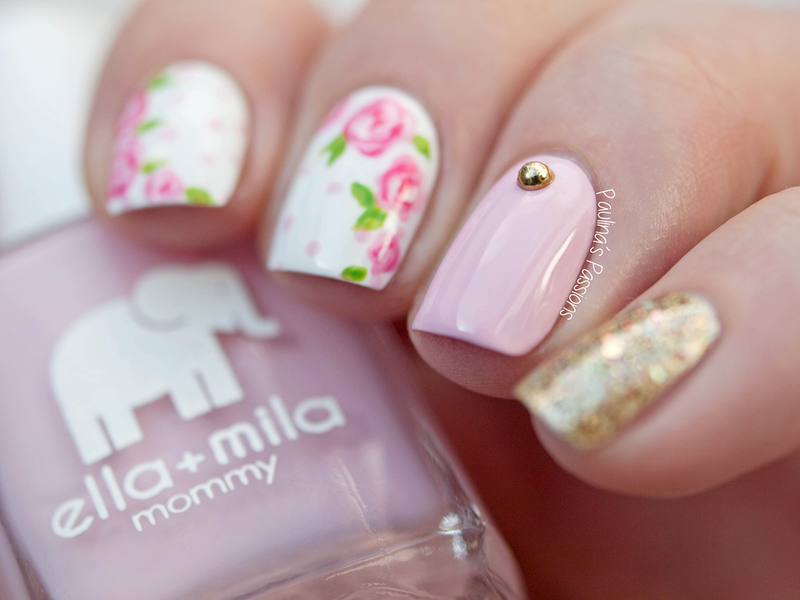 And her nailshape and length, there is just something so utterly cute about them <3. If you are as curious as I am to see what she prepared, keep on reading! Hi the Awesome Readers of the Love Varnish blog. Deborah has always been my swatch master. I think you know what I mean when I say that. Her swatches are always flawless and I love visiting her blog for nail polish updates and new collections. Since we belong to the same small nail polish group, I also got to meet Deborah a little bit better and she is one of the sweetest and kindest person in the nail polish community. Today I am taking over Deborah's blog to show you a small nail art I made for this guest post. It's a simple one, but quite girly and I love how it turned out, so hopefully you will too. Is there anything cuter than pink roses over some sweet polka dots? I started my rose nail art with a clean, white base. I used my reliable Saint Gill no. 02. It's a really good, opaque white nail polish. Then with a tiny dotting tool and a pale pink polish I made the dots. It's Ella + Mila So In Love (the name is so appropriate! ), which is also featured on my ring finger. I made the roses with a pale and darker pink. I also added some white highlights and a pop of green in the leaves to brighten everything up. At the end I added a little stud over the pink base and totally glittered up my little pinky. I used my oldie, but goodie Shimmer Polish Tracy. It's one of my favorite golden glitters of all times! Sweet and simple, right? I really hope you like my little roses. Simple flowers and more detailed floral looks are always my go-to nail designs and I think I will never get bored of them. Thank you so much Deborah for having me here. It's truly an honor to be writing a guest post for such a nail polish icon like you. I hope you are enjoying your vacation and that you'll be back really soon with more awesome nail stuff. Wow, wow, wow. Did I exaggerate when I said this girls has skills?! Those little roses are perfect and I love the added golden glitter! Thanks so much Paulina for this wonderful post <3.